Due to my inability to book holiday without procrastination I've been able to benefit from a fair bit of time off in recent days and as luck would have it, it transpired that events had unfolded to provide me with a unique opportunity. Justin Welby - The new Archbishop of Canterbury, has been progressing through the country on a prayer pilgrimage ahead of his enthronement on the 21st March 2013. 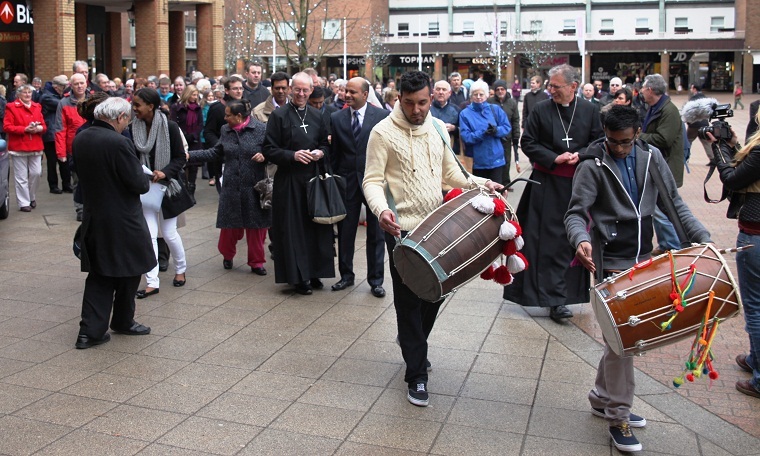 The second sojourn of his journey led him back to Coventry - the diocese where he had spent roughly 15 years of ministry, culminating in his tenure as Sub Dean and Canon for Reconciliation Ministry. Having the day off on Friday, I decided to take part in the event - both the church I worship at and the church I grew up in are part of the Diocese of Coventry and its cathedral is therefore in "old money" terms, my mother church. I decided that I was going to make as much of a day of it as I could and found myself strolling into Broadgate at the early hour of 8:30am. As I was early I wandered back and forth, to and fro as the market was being set up and the PA system was being rigged for the welcome address. I approached some local dignitaries... who promptly backed off, apparently intimidated- maybe it was a bad idea for a 6'4" leviathan to wear a hoodie, or maybe they were just picking up on some kind of Alcestrian aura emanating from me. 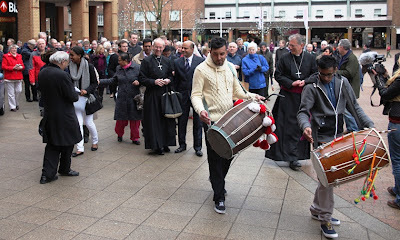 Drummers Leading Archbishop Justin to the Cathedral. Eventually the Archbishop arrived and after a meet and greet with the local media followed by a welcome by Coventry's mayor and a brief prayer of blessing, those of us who had gathered made our way to the ruins of the old cathedral... led by some drummers. 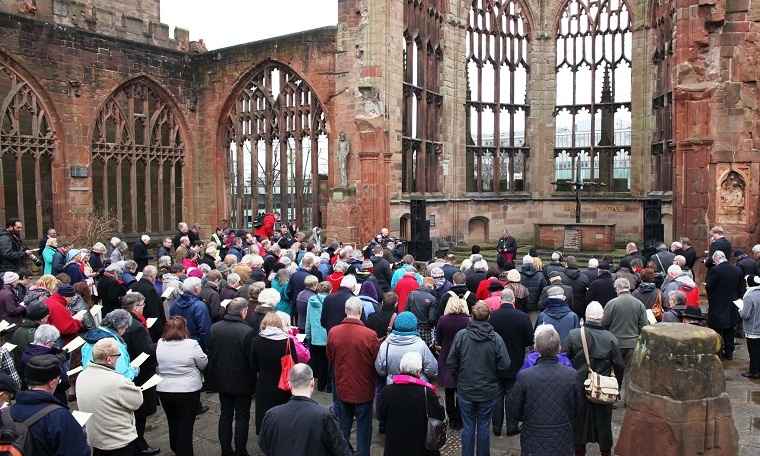 As we arrived, it became apparent that larger throng had gathered outside the cathedral and together we prayed through the Litany of Reconciliation. Following this we all made our way into the cathedral, which had been divided up into a series of 9 prayer areas with different formats for different people to use. I love Coventry Cathedral; for those of you who don't know, it is a relatively new building that is nestled among the ruins of its predecessor... which was devastated during the destruction of Coventry by the Luftwaffe. I like the distribution of stained glass windows... on the inside it looks very much like something that you might expect to find on the Minbari homeworld in Babylon 5. I'm also extremely fond of the star and circular shaped chapels at each end. When you look back from the nave, the entrance window is filled with frosted figures of angels and saints that seem to hover above the ruins... keeping watch over the cathedral and the city. As previously mentioned, I was there for the whole event and decided to work my way around the various stations as best I could... and aside from praying for the Archbishop made the day something of a prayer retreat... something I haven't done for a good while. Being fond of Celtic expressions of prayer, I made my way to the round Chapel of Christ the Servant. and sat there working through a few prayers. I must have looked a little odd because I'd taken my shoes off... it's a biblical practice that I've adopted when seeking a deeper focus in prayer... and I guess I've picked it up off my old vicar, Steve Burch. Straight away I felt my thoughts being tugged towards issues that periodically cycle from latency to active burden in my heart. I felt very much hemmed in and awestruck. Following this period, I made my way to a Powerpoint station which split the Lord's Prayer up in segments with a particular focus for each line... designed to take 15 minutes to work through. I then made my way down the nave and bumped into some folk from my hometown. I chatted with them briefly and tried not to draw too much attention to my shoeless condition (no luck there), I then made my way to a Labyrinth that had been laid out in the centre of the nave. Funnily enough, this actually required me to be shoeless and having read through the gist of the prayer format, I started out. It was not to be however, as I was yanked out by one of the people from Alcester because the hourly prayer led by Archbishop Justin was starting. I know he thought he was doing the right thing... but I was seriously getting in the zone and it disrupted me - he should have left me to it really... but never mind. A bit like not being able to get back to sleep having been woken by something, I joined the other people in the nave and prayed the hourly prayer. The meditation required me to examine which part of the text jumped out most vividly to me (I've highlighted what I experienced for you). I felt extremely challenged by this... I'm very guilty of being the kind of Christian who looks for signs and desires wisdom before committing to a path... and I felt that I was being advised that I already know what I need to know... the silence that I have assumed to be in place... has not been real at all. When you reach the centre of the Labyrinth, you are supposed to just get comfortable and allow God to have you... and not do it at "drive-through" pace... but to be still and wait for God. The final station I came to as I was working my way out, was a biblical meditative vision quest; I'm very fond of these... and I think people should be aware they exist, because they are a powerful area of spirituality that largely remain untapped in the Western church while people flock to similar such things that are available from the more questionable sources in Eastern mysticism. The passage used was the account of Jesus appearing to disciples on the Road to Emmaus. It invited me to breathe the air, to hear the dusty road beneath my feet, to see the hooded stranger and to communicate with him and talk about the kind of feelings that were associated with the people in the passage. I remember very strongly at the end of this meditation seeing Jesus give a wry smile and a wink before vanishing. I felt his reassurance and that he was filling me with hope for the road ahead. As I drew to the end of the Labyrinth, a period of contemplative worship was being performed by a man called Jimmy Lawrence. I felt deeply moved and sang along solemnly. This drew the next hour to a close and we prayed again with Archbishop Justin. For the next hour I kept drifting towards the accompanied prayer area... but there never seemed to be anyone to pray with. I felt like I could have done with that at that time. so for the next hour I sat and gazed at the baptistery window in silent contemplation. Eventually hunger got the better of me and I made my way down to the refectory to grab some sustenance. As there were no empty tables, I found myself talking to one of the cathedral chaplains and a visiting couple. Halfway into our chat, the old lady asked me if I was a vicar. I said that no, I wasn't... and I had a familiar strange feeling in the pit of my stomach. Just before 2.00pm I returned for the final hour of prayer and after Archbishop Justin had prayed with us... I decided with a small group of others to go forward and meet him. Upon greeting him, I took the opportunity to pray over him for his ministry and he in turn prayed for me. Following this I tied a prayer to the prayer tree and submitted some prayers to the prayer text service that was scrolling on a screen on the right of the cathedral. It was an amazing experience. I truly feel God took a cacophony of emotions and experiences and forged them into something immensely powerful and awe inspiring. I also think I know what that feeling I get when people ask me *that* question, is about. It's embarrassment. I feel it may be akin to the feelings that Peter must have felt when people asked him if he was one of Christ's disciples in the early hours of Good Friday. I think that gives me something really challenging to look at.... and requires me to act perhaps more swiftly than I might appreciate. All in all, my time at the cathedral felt very much akin to being in a crucible.